Is Galway the Most Irish Place in Ireland And the Best Place to Visit? Clinging to the wild, west coast of Ireland, Galway may be the most Irish town in Ireland. Its Old City is chockablock with pubs, shops, cheesemongers and restaurants, and everything else any good Irish city should flaunt. Its weaving cobbled lanes are a riot of reds and yellows and blues and greens that run on forever. And it retains a bohemian flavor, thanks to its youngish population. For many who visit Ireland, the Galway area is the pot of gold at the end of the Gaelic rainbow. There’s no denying that Galway is charming. In fact, when you walk about the Old City you get a sense you’ve peeked behind the curtain. Many of the old traditions continue to survive in the area, even as they slowly ebb elsewhere in the country. More than in the rest of Ireland, traditional Gaelic is still spoken among friends here. And traditional music wafts along its cobbled ways by day and from its many crowded pubs in the evening. 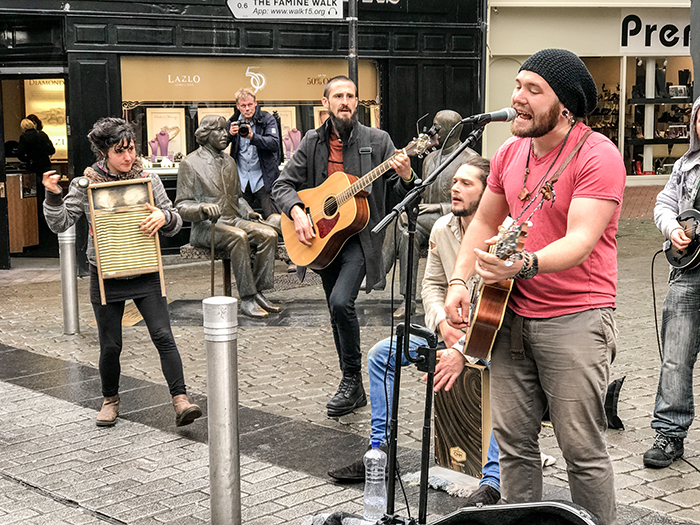 You can’t help but notice Galway’s vast wealth of street musicians, another tradition, with more here than in other cities. Galway remains one of the liveliest places in Ireland and is a great place to enjoy traditional Irish culture. It’s certainly one of the best places to visit in Ireland. Although I’ve been to Galway several times, last week was the first time I visited Cnoc Suain (Restful Hill). A restored 17th-century village on 200 acres of ancient bogland in Connemara, it’s less than a half-hour outside Galway. It’s also in the heart of the Irish Gaeltacht, the Gaelic-speaking area of Ireland. Cnoc Suain is the home of Dearbhaill Standún and Charlie Troy, an Irish couple devoting their lives to sustaining Gaelic culture. 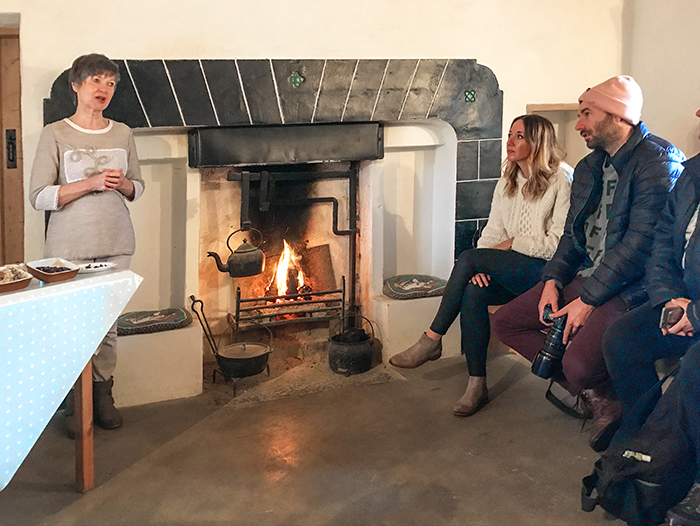 Speaking with Dearbhaill and Charlie in their thatched and slate-roofed cottages, my small group got a taste of Gaelic culture. It was a fascinating and immersive way to savor Irish history and traditions with gracious hosts. If you’re in Galway, set aside some time for a visit, especially if you’re of Irish heritage. 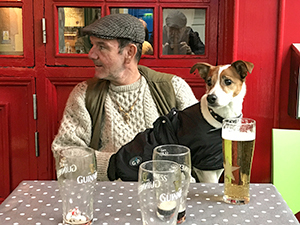 Another tradition in Ireland is its pub culture, which thrives throughout the country. 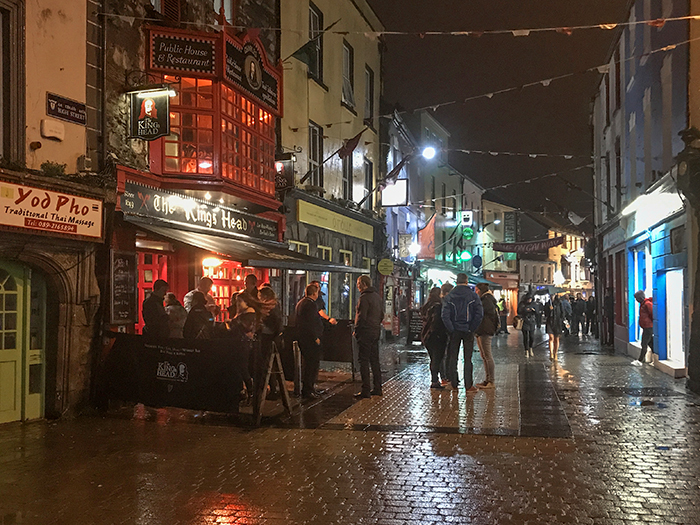 In Galway, you’ll find plenty in the Latin Quarter, the heart of the Old City. Most have live music each night. 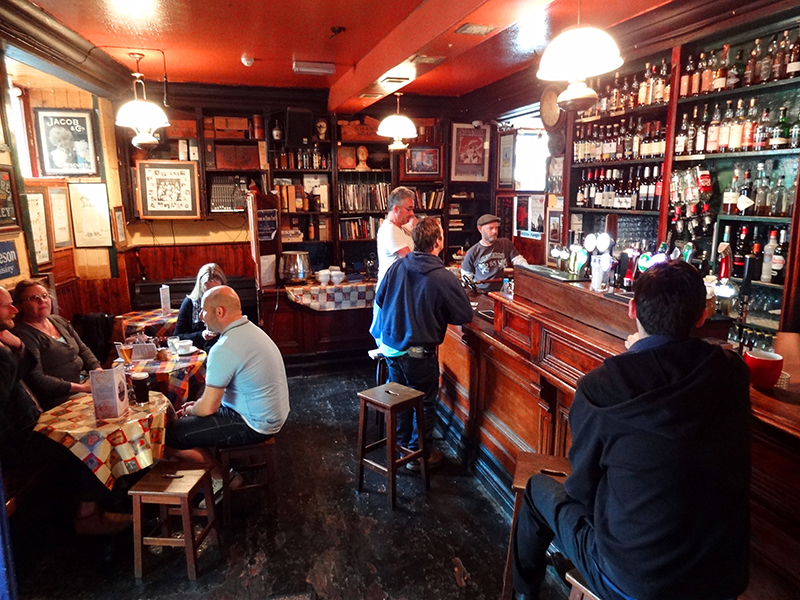 Walk along Quay Street, for example, and at number 17 you’ll find Tigh Neachtain. Brightly painted blue and yellow, it’s a warren of little rooms and old-world snugs where peat smolders in the fireplace. It’s the atmospheric kind of place where you feel that time has come to a complete standstill. Continue 200 feet up the street – the name changes to High Street here – and you’ll find the 17th-century Kings Head. It’s an old pub that also has a large, and good, restaurant. Across the street, the bright red Tig Cóilí attracts a mix of Galwegians and tourists. Although I’ve enjoyed the music there during past visits, Tig Cóilí didn’t quite hit the mark this time. So after a while, I again crossed the street to Taaffes Pub, which I had never visited before. 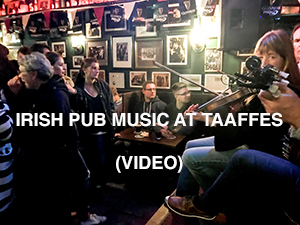 Taaffes adverts itself as an “Irish music bar, ” and it’s right on the mark. I pushed through the front door and found a crowd drinking and listening to lively traditional music. It’s a great pub to stop by for a pint and the “craic,” or traditional Irish fun. At any time you also find plenty of places to eat in the Latin Quarter. Walk along Quay Street, and the painted people on the upper windows of Riordan’s will undoubtedly catch your attention. It proudly advertises its home-cooked Irish food. Across the street is McDonagh’s seafood house, which does a brisk take-out business. A few shops down is The Quays restaurant , with several bars and dining areas on different levels. Its favorite dishes include traditional Irish Stew, oak-smoked salmon salad, and fresh local oysters. Galway, by the way, hosts a popular international oyster and seafood festival every September. It was also just selected as the European Capital of Culture in 2020. 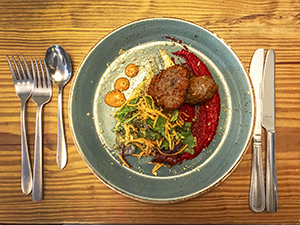 You can also have an excellent meal in The Kitchen restaurant in the Galway City Museum. 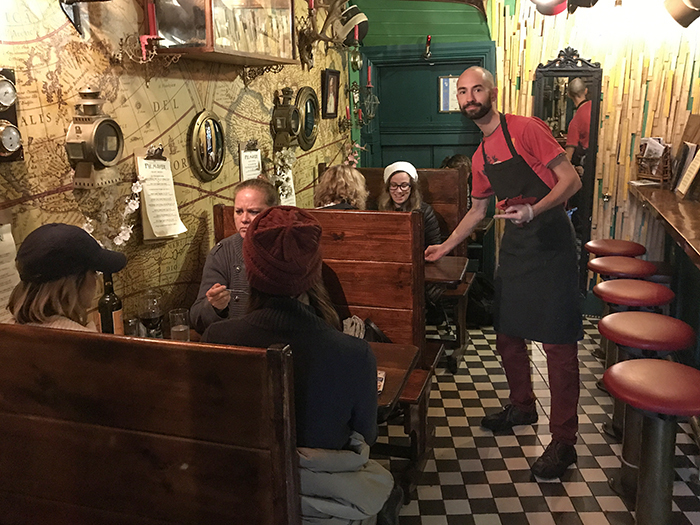 The food and service are top-notch, and you can work off the calories learning about the history of the city. For dinner, you may want to dine at The Kings Head, as I did, back up High Street. The food and service are quite good. And it’s a relaxing place to listen to music while avoiding the larger crowds in other pubs. The Latin Quarter and the entire Old City are quite compact and perfect for walking. On my wandering during a past visit I walked over to the Church of Ireland’s St. Nicholas Church. From a historical perspective, it’s more interesting than the Catholic cathedral on the other side of the River Corrib. Most interesting in St. Nicholas is the plaques on the walls around the church, some dating from the 1700s. They include one dedicated to Jane Eyre, who donated to the church bread to be given to 24 poor people on every Sunday during their lives, forever. After leaving the church, I walked down Churchyard Street to Sheridans Cheesemongers, an interesting cheese store. (I find most cheese shops interesting). 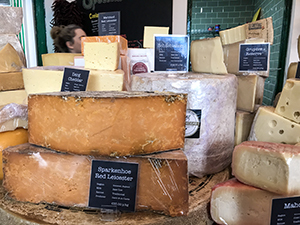 It offers an excellent variety of Irish, British and European cheeses. I looked about for a while but resisted temptation and continued up the street pass Griffin’s Bakery. It appeared popular both for its baked goods, and it’s take-out sandwiches and sweets. At another time I found temptation in the cozy shop The Pie Maker, blocks away at 10 Cross Street Upper. Griffin’s is at the lower end of Shop Street, a continuation of High Street. It’s the heart of the city and during the day is an impromptu stage for a variety of street musicians. Walking down High one morning, I came across a quartet surrounded by a small crowd. They were singing traditional Irish songs, keeping up a banter with the crowd and selling their CDs for €10 each. “Be sure and buy one of our CDs,” one musician called out, ”you can’t buy it in the stores.” “They won’t have anything to do with it,” chimed in another. It was pure Galway, just as I’ve experienced it over the years. The street musicians you see throughout the city don’t play just for tourists, but for their fellow Irishmen, as well. And often you’ll see older Irish walking by come over and drop a few coins into a guitar case. A euro here, a euro there…all little contributions to help keep the old culture alive. We where just in Galway and your opinions of Galway are spot on, fantastic place…so glad we had 4 days there. We stayed in a flat across from the harbour and a short walk to the Latin quarter, the pubs, restaurants and the vibe is phenomenal. When I come back to Ireland will definetly go back and experience more that it has to offer. Love it! Thank you June. I’m glad you share my feelings for Galway. It’s a city I love! Love these pictures and interesting places to see. Thank you. Galway certainly looks like a charming Irish town. I like the pub and bar culture and the musicians entertaining on the high streets. As a tourist, I would love to keep my bag in the hotel room and roam around in the streets all day soaking in the fresh air of Galway! And there’s plenty of great music in the pubs at night, as well. I love Galway. It’s one of the youngest and coolest towns in Ireland. It sounds like Galway is a great place to get lost, meet a bunch of new friends, stay perpetually hung over and eat like a fiend. Sounds like my kind of place. Thanks for the recommendations on pubs and restaurants. It would be fun to explore more. I would love to visit Ireland one day. Galway sounds charming and like a good place to experience Irish culture. It’s really nice that the street music isn’t just for tourists, that locals appreciate it and support it as well. I’ve always heard such amazing things about Galway! Unfortunately when I was in Ireland we didn’t have time to add this to our itinerary so I hope to get back there one day and truly experience the traditional charm of this town. And to try that Pie Maker shop. Great photos as well! I really enjoyed Galway, it is a pretty city as well as having lots to do there! 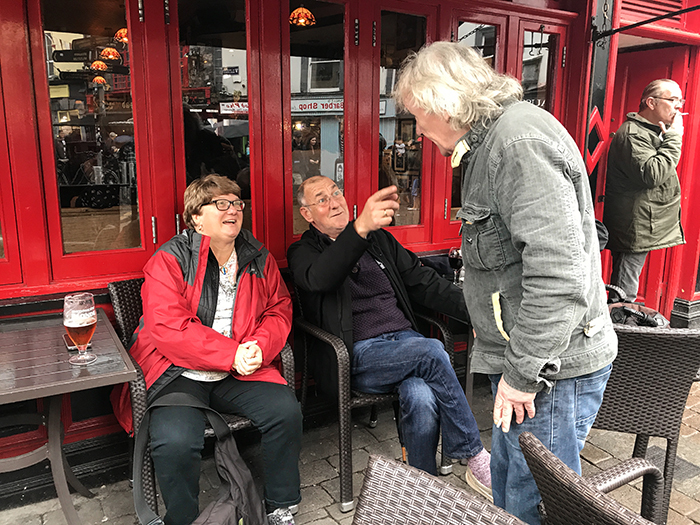 I certainly enjoyed the ‘craic’ and visited several of the pubs in Galway. It’s also great for day trips to explore more of the region too, I’d love to spend more time there. When somebody mention Ireland, first that comes to my mind is Dublin, but glad to hear and see other side. I have a lot of friends who moved there, I would like to visit them there. But definitely love it, thanks! Ah, we love markets like these. They let us glimpse and experience into the true culture of the place. Buskers and cheese—perfect!